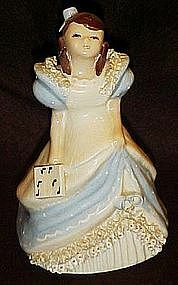 Vintage California pottery girl figurine most likely by Yona but is not signed. Yona worked with Heidi Schoop back in the time these were in production and eventually went out on her own. Has an imprinted F in the botttom of the piece (probably stands for figurine). Someone has written Caroline on the bottom in pen where they once Id'd her at on time. She wears a blue and white dress and has her skirt pulled up to reveal layers of petticoats. She has ceramic lace edges on the shoulders of her dress,and on her petticoat.Also has the typical face and eyes of a Yona or Ynez piece. She holds a music book, and may be one of the choir pieces Yona made. She measures 6 1/4" tall and has very slight lace damage. No cracks or chips but has minor crazing which is common for these old pieces.